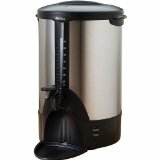 Unit measures 11 2/5" by 10 2/5" by 15 2/5"
This coffee urn is well made and durable with a housing constructed of stainless steel. You may need to get used to how to dispense coffee as this urn doesn't use the standard push the lever down type of lever. You have 2 levers which you have to push together to dispense the coffee. The urn is well insulated, keeping the coffee hot longer once it is brewed. It is also one of the few urns that you can fit a tall cup under the spigot. Unit brews excellent tasting coffee, keeps it hot, is very durable, and is easy to clean. Features an easy to read water level indicator, stainless steel brew basket, has power/ready indicator lights, 40 cup brewing capacity, removable drip tray, lock on lid for transporting, and has a 1 year limited warranty. I can highly recommend this urn.